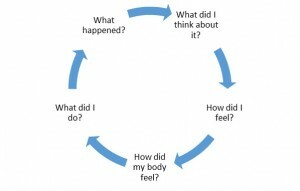 10 Minute Mini Lesson One is designed to provide a basic understanding of the CBT concept of Cognitive Restructuring. Q: Tell me about a specific, recent time when your pain increased. A: I got upset because I had too much back pain to even do the dishes. Q: What was running through your mind when [the event] happened? A: I’ll never be able to do anything normal and my husband will leave me. A: I felt worthless and hopeless. Q: Did you have other feelings like [anger, fear, sadness]? A: Well, I guess anger because this has been going on so long. HOW DID THEIR BODY FEEL? Q: How did your body feel? A: My back was on fire. I felt like I couldn’t stand up. Q: What did you do at that point? A: I took an extra pain pill but it didn’t help, so I called for an appointment. Explore using yourself as a model. Use the patient’s own words as much as possible. Help the patient make their own connections and discoveries. Your main goal is to get the patient to THINK DIFFERENTLY about their situation. 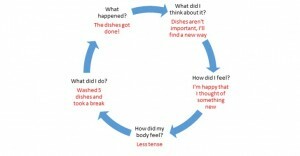 Much of this THINKING may occur at home after the visit. 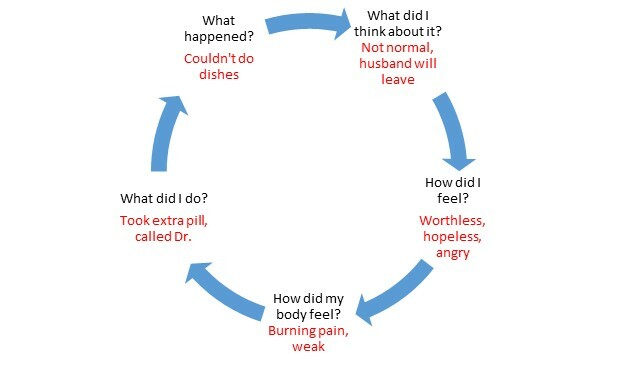 OFFER COGNITIVE EMPATHY: If I thought I wasn’t ever going to be normal and my spouse would leave me, I would also feel hopeless and worthless and angry and want the doctor to fix me. Q: Is there something different you could THINK about [event}? A: I need to find a different way to get this done. Dirty dishes are not the end of the world. COACH on possible answers if they don’t come up with any on their own. 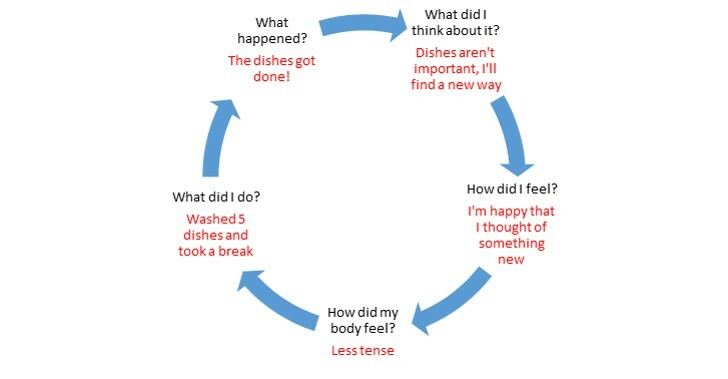 Q: How might you FEEL if you thought that about the dishes? A: I’d be happy that I had a good idea. I wouldn’t worry about it as much. Q: How would your BODY FEEL? A: Maybe I wouldn’t feel so tense. A: I’d wash five dishes and then go watch my favorite soap for 10 minutes. 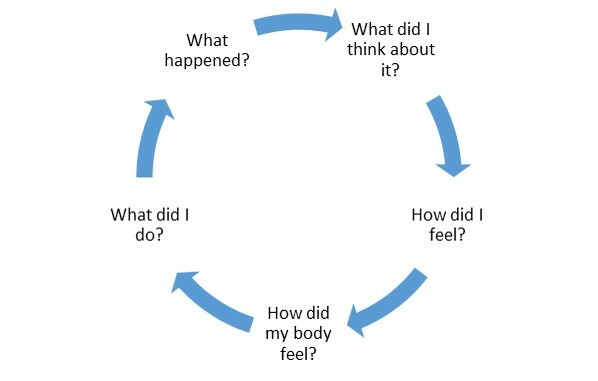 HOMEWORK ASSIGNMENT: Ask patient to fill out a new CBT Cycle Diagram AT HOME with the NEW thoughts, emotional and physical feelings, and behaviors (which might look like this). 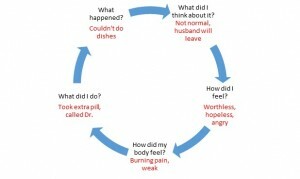 Encourage patient to use this new skill at least once a day (supply them with blank CBT Cycle Diagram forms). Ensure them that regular practice will lessen their pain, improve their mood and self-confidence, and make them less dependent on medications. Every adult in the U.S. knows what happens on April 15. But do you know the significance of the following day? April 16 is National Healthcare Decisions Day. It is a day designated to highlight the importance of people filling out their own Advance Directive (AD), no matter how young and healthy they are. The theme for 2016 is “It Always Seems Too Early. Until It’s Too Late.” The idea is to let people know that something catastrophic can happen to anyone at any time. That is why filling out an AD is important for everyone. Physicians understand the importance of ADs. But our profession has not been that successful in getting our patients to make their wishes known and fill out these forms. The time available during appointments is limited and usually filled with other pressing issues. Talking about end-of-life wishes can be uncomfortable for patient and clinician alike. But it is an important issue to address periodically with every adult patient, as important as reviewing standard medical screening tests, updating vaccinations, and talking about healthy lifestyle. Have a supply of Advance Directives available in your exam room. Being able to hand your patient the form will make it more likely the patient will fill it out. Make use of April 16 as National Healthcare Decisions Day as a way to introduce the subject. Make sure you and everyone in your family has filled out an AD. Being able to tell patients you yourself have filled out your own AD, as has your spouse and adult children, can help make the issue less daunting. It can reassure patients that you are not bringing it up because you are worried about their health, but because you are as concerned about them as you are about your own family. Identify one or more people on your staff who can be educated on how to talk with patients about the importance of ADs, and build time in to office work flow for them to talk with patients about this issue. The responsibility does not need to rest exclusively on the PCP. We will never get 100% of our patients to fill out ADs, just like we will never get all our patients fully compliant with all their needed health screenings. But by working to normalize this sensitive subject, we can get more of our patients to make known their wishes for end-of-life care. Even though April 16 is now in the past for this year, the importance of getting our patients to fill out their ADs is a year-round challenge.